I was asked to edit a collection of articles researched and written by Dr. Rachel Hajar for the History of Medicine section of Heart Views. I found the historical information she provided was accurate to the best of my knowledge. In fact, I am glad that I did not find a need to alter or add anything to what she wrote because as a non-Arab, she probably is more objective than an Arab like me in discussing the history of the Arabs. However, I would like to make a few comments as introduction to her articles. She chose as her title "The Golden Age of Arab Islamic Medicine." There is no agreement by historians on what to call the medicine during the Arab empire era. Some have called it Arab Medicine or Muslim Medicine, while others preferred to call it Islamic Medicine because it was in the context of an Islamic state or Muslim empire with many non-Arab Muslim physicians. That was not accurate also, because many Christian and Jewish physicians and scientists in the empire had leading positions in medicine then. Islam is a religion and should not be mixed with medicine, but some Muslims say that Islam is also a way of life and as such encompasses all aspects of life. Furthermore, there are some Muslim scholars who wrote books on the medicine of the Prophet Muhammed, who called it "Al-Tib al-Nabawi" and which was based on the Prophet's sayings on different occasions. Unfortunately, some called that also "Islamic Medicine," causing more confusion of terminology. In fact, "Al-Tib al-Nabawi" is a collection of the Prophet's health advices. Most had good public health values, such as avoiding overeating, avoiding a patient with leprosy, not entering a town hit with the plague, etc. I have no doubt that the Prophet's health advices were based on the teachings of Al-Harith ibn Kildah, an Arab physician and contemporary of the Prophet. Al-Harith was well known to the Prophet and he gained the respect and trust of the Prophet who advised his sick disciples to go to Al-Harith for medical care, even though Al-Harith never became a Muslim. He was the first real pre-Islamic Arab physician as well as the first Arab physician in the Islamic era. He was both a physician and musician who graduated from the Greek medical school in Jundishapur, Persia. Al-Harith was so famous that the Persian King Kisra (Chosroe) asked him for health advices. Some historians confused the senior Al-Harith ibn Kildah, the physician, with another Al-Harith ibn Kildah who was a layman, cousin, and an enemy of the Prophet. 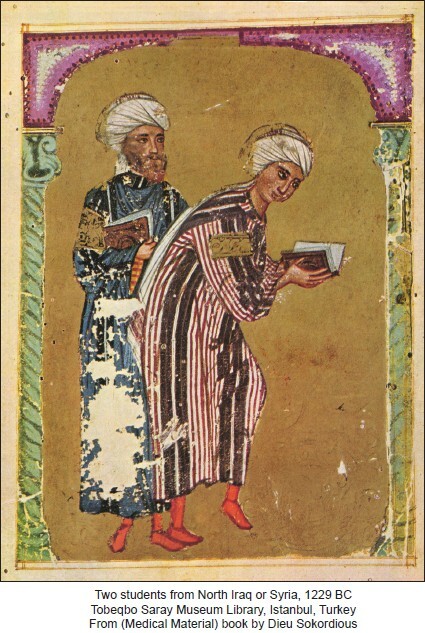 On the controversy of the value of the so-called Prophet's medicine, Ibn-Khaldun (1332-1382), the famous Arab historian, Islamic scholar, judge, and founder of sociology, said (in his introductory volume of history p. 493): "God did not send the Prophet Muhammed to teach us medicine but religion." Muslim Medicine or Islamic Medicine, the frequently used terms by historians, is not appropriate in my opinion. What is wrong with the term "Arab Medicine" in reference to Arab civilization? Such a term is also supported and linked with the Arabic language. Arabic was the language of science in Arab civilization. It was the common denominator for the scholars of all regions of the Islamic world which stretched from India to Spain. It was the language of famous medical centers then in Baghdad, Damascus, Cairo, and Andalusia (southern Spain). All scientists and physicians, Arabs and non-Arabs, Muslims and non Muslims read, wrote, and communicated in Arabic during a period spanning 10 centuries, from the 6 th to the 16 th . Arab physicians like Ibn Nafis and Al-Zahrawi wrote their medical texts in Arabic, and so did Ibn Sina, a non-Arab Muslim who wrote his famous book The Canon in Arabic and wrote Arabic poems as a teaching method in medicine. Arab physicians translated to Arabic medical knowledge mainly from Greek, which incorporated Babylonian and old Egyptian medicine. Arab scholars in that period also translated scientific knowledge from Indian, Chinese, and Persian origins. Individual physicians working in Baghdad then could be a Persian, Christian, or Jewish physician, but practicing Arab medicine. At the present time, in Europe and the USA, there are many physicians of different ethnic origins such as Arab, Indian, Chinese, and Latin American practicing "western or American medicine." In fact, the medicine we practice today in most of the Arab world is "western medicine" using the English or French language in our hospitals. The golden age in Arab Medicine is the same as the golden age of Arab civilization, which was during the Abbasid phase of Arab history from 750 AD and did not end with the destruction of Baghdad in 1258 AD, but continued in Damascus, Cairo, and Cordoba. In the 9 th century, around 832 AD, Caliph Al-Mamun established Dar al-Hikma library (House of Wisdom) in Baghdad. Science, medicine, and philosophy books were translated to Arabic. Translators were compensated by the weight of their manuscripts in gold. The physician Hunayn ibn Ishaq reportedly used large letters and triple or quadruple spacing on heavy weight paper to increase the weight of the manuscript. That translation period was the foundation period when the Arab medicine was mainly Greek medicine. The Late Abbasid Phase (900-1300 AD) was the golden age of Arab medicine. This is the phase of original contributions of Arab and Muslim scholars, as compared to the translation activity of previous centuries. There were many prominent physicians who made great original contributions to the science of medicine. The works of many famous names such as Ibn Sina, Rhazes, Ibn al-Nafis, Ibn Zuhr, and al-Zahrawi (Albucasis) became and continued for a long period to be crucial references for medicine. The influence of their works extended to as late as the 18 th century, when the seeds of modern medicine probably started to develop. An old Arab saying goes thus: "Medicine did not exist before Hippocrates created it, dead before Galen revived it, scattered before Al-Razi collected it, and incomplete before Ibn Sina (Avicenna) completed it."